The Hurtta Winter Jacket is a warm, waterproof coat. 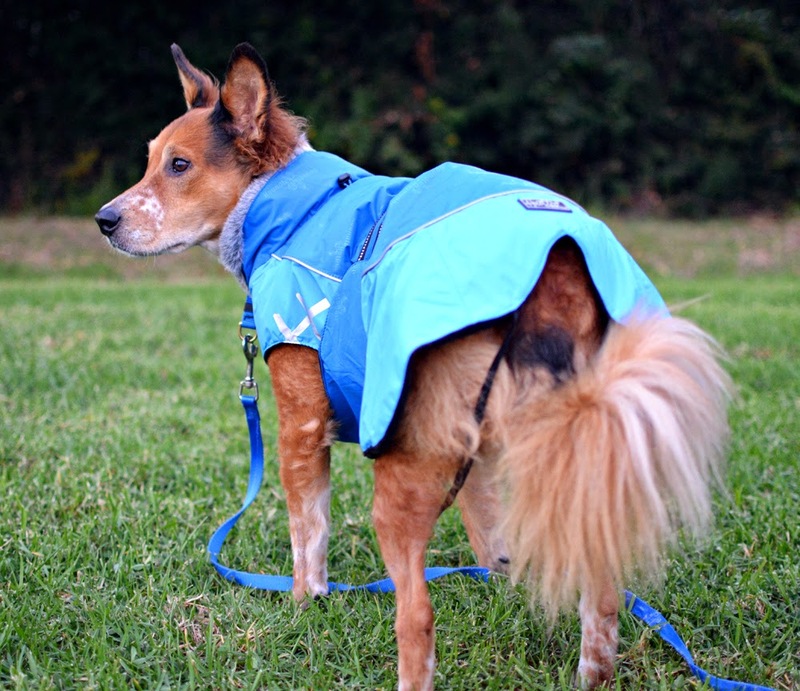 It is available in several colors and an incredible 15 sizes to fit dogs with backs 9-33" from neck to tail. I found these coats at Ross for crazy cheap, otherwise I probably wouldn't have acquired serious winter gear for my California beach dogs. 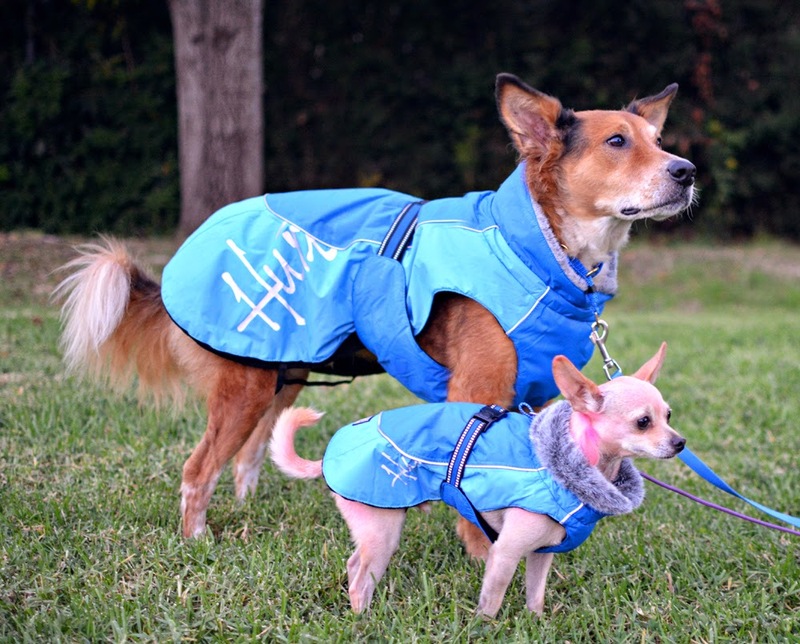 Hurtta is a company based in Finland, so they make serious serious winter clothes for dogs. Look at these jackets, they have belly protectors and furry collars and they cover a whole lot of dog. There are even elastic straps to go around their back legs to keep the coats in place on their butts. These are some seriously warm dogs. My favorite thing about Hurtta dog clothes is how infinitely adjustable they are. Brisbane and Ru both have long backs for their heights and chest diameters, so a lot of stuff fits weird. Many coats that are long enough to fit their backs are are also too wide around the neck and chest. These Hurtta Winter Coats have adjustable necks that can be tightened to keep them from sliding down. The waist belts can also be adjusted down until they reach the edges of the belly panel. Brisbane's coat is an 18", a little roomy. It also fits Ulysses perfectly. Ru's is an 11" and it fits him well. Ru wears his a lot more often than Briz. Pros: There are 15 sizes, each 2" apart in length, so getting something that fits is possible for most dogs. The adjustable neck and waist help get the sizing just right, and the rounded rear and elastic leg bands keep the coat in place. The fizzy collar is adorable, and can be turned up for added warmth and rain protection. Cons: Leg straps make Brisbane give up at life. The rounded back end of the coats mean they fit a little awkwardly on a slightly-too-long dog. Bottom Line: Super warm, designed by people who have to weather some amazing winters. So far my boys have only worn them during one of our very rare rainy days. If will definitely be taking Brisbane and Ulysses to the snow if we get any in driving range this year. I found this at my local Marshalls too, I was soo tempted to buy it bc it was in my dog's size, but alas living in CA there probably won't be a chance to use it.